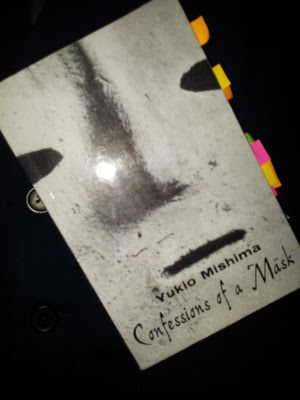 I’m not going to speak much about Japanese writer Yukio Mishima’s Confessions of a Mask. A modest description: the fraught inner confessions of a closeted man coming up in Japan between the 20s and 50s. But the book is also a meditative (sometimes to the point of brooding) and introspective encounter. One you’ll have to witness for yourself–if you will. I say that because the book seems driven more or less by plot, and it wasn't until its conclusion that I took it as less. So to me, Confessions of a Mask wasn't a diarist scratching pen to paper underneath a burning candle. Though it's easy to see the book that way, as it chronicles the events of Mishima’s protagonist from childhood to adulthood. However, a stimulating and introspective piece of fiction is what I left the book with–carried by a genuinely captivating protagonist. So, thankfully, Mishima's lead owned a keen grasp of his surrounds and inner conflicts. Enough to keep me engaged with his musings, and either frowning or grinning at his choices. Within Mishima's protagonist, the book addresses familiar social, psychological, and physical arenas visited by gay men. And the protagonist delivers pieces of the verbose identifiable with others who've found themselves locked in his view and scenarios. However, an acknowledgeable distinction comes from the region, culture, and time the book takes place. To elaborate a little, Mishima’s protagonist finds a multitude of reasons to acquaint an attractiveness for death with being gay. Though the contemplation of death is not foreign for gay men to preoccupy themselves with; culturally speaking, many Japanese have a reverence for the subject of death (research Shinigami or Buddhism from the Edo Period forward). This, in turn, shined a lot more brightly in Mishima's Confessions of a Mask. Though that absolutely doesn't qualify as a detriment of any sort. I only found it part of the flavor and uniqueness of this particular experience. It also slipped in a sense of suspense regarding the protagonist's fate. Wonderful book. Easily five stars for me. I will definitely follow up on more Mishima novels.